Retro styled kitchen in pink from the USA. This exceptionally high quality wooden kitchen play set is the ideal kids nursery toy, great for role play. Made from high quality wood, this retro kitchen features a stove and a fridge. Built to last all childhood (and beyond)! 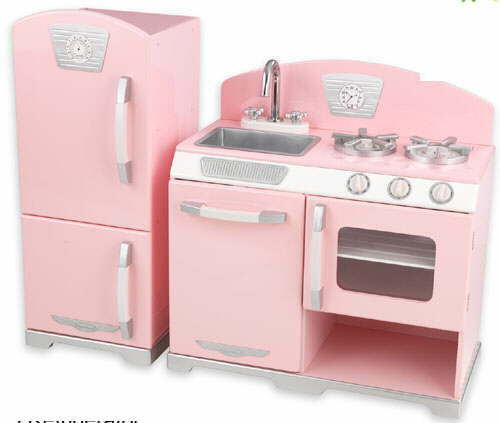 Little cooks can't stay out of our charming retro play kitchen, with sink, oven, stovetop, and dishwasher. And wow: it even includes a matching fridge, with trendy bottom freezer! Provides tons of storage space, and kids love the clicking, turning knobs. Little cooks love to open the doors, pull out the drawer, turn on the faucets, and more. So wonderfully realistic, kids can even "set" the oven timer and check the fridge's play thermometer.